The Lid Margin, in contact with the eye ball, contains the Meibomian oil glands in the back and the eye lashes in the front with the lid muscle for blinking and eye closure in between . It has different zones and some essential functions for the heal of the ocular surface. The margin of the eye lid is the area of the anterior eye around the palpebral fissure where the outer oily-dry skin on the outside of the eyelids and body transforms into the aqueous-moist mucosa of the conjunctiva at the ocular surface. This is also the place where the Meibomian oil glands, that are located inside the eye lid plates, have their orifice and deliver their oil onto the lid margin from where it gets into the tear film lipid layer. Due to the enormous increase of interest in MEIBOMIAN gland function and dysfunction after the TFOS MGD Workshop Report on Meibomian Gland Dysfunction in 2011, that had revealed lipid deficiency in Meibomian gland dysfunction as the primary causative factor for dry eye disease, the research on the lid margin has enjoyed a revival. 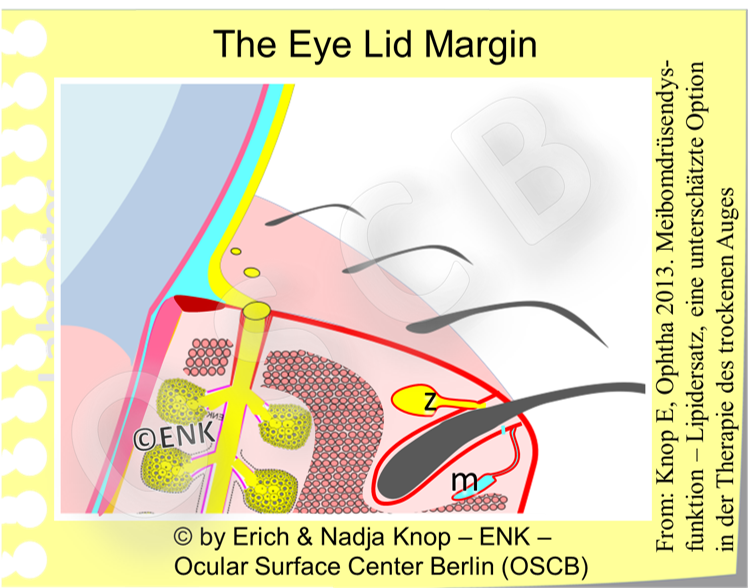 The lid margin has been of interest to members of the Ocular Surface Center Berlin (OSCB) for almost two decades, dating back at least to the Meibom 2000 congress in Boca Raton. This meeting was organized by John Tiffany in order to commemorate the 300th anniversary of the death of Heinrich Meibom. He was the first detailed describer of the Meibomian glands that were named after him. In these years after the 2000s falls also the renewed interest in another lid margin structure of hitherto underestimated importance - the LID WIPER. This epithelial elevation at the inner side of the posterior lid border that serves for the distribution of the tear fluid into the very thin pre-ocular tear film, received its present name from Donald Korb, when he detected a pathological vital staining at the posterior lid border. This pathology is termed as Lid Wiper EPITHELIOPATHY (LEW) and it occurs in conditions associated with increased friction at the ocular surface. Members of the OSCB have contributed to both of these fields (Meibomian glands and Lid Wiper) and have performed the first detailed histological study on the morphology of the posterior lid margin and of the lid wiper. Our study has revealed some groundbreaking findings such as stratified non-squamous epithelium at the lid wiper with a ´built-in´ lubrication system of mucin producing goblet cells and goblet cell crypts that were previously unknown in this location. Members of the OSCB have also contributed in and acted as chair for the TFOS MGD Subcommittee on Anatomy, Physiology and Pathophysiology of the Meibomian glands. This subcommittee report revealed and named the decisive literature citations that verified the enormous and underestimated importance of lipid deficiency as the main causative factors for dry eye disease in about four fifth of dry eye patients and also developed the complex summary figure that revolutionized our view on MGD and thus also on dry eye disease. Members of the OSCB have also organized several international Special Interest Symposia on different aspects of the lid margin at the annual meetings of the European Association for Vision and Eye Research (EVER). The lid margin is an essential structure in the maintenance of the pre-ocular tear film and of utmost importance for the functional anatomy of the ocular surface in order to preserve its integrity. With relation to the tears the lid margin has at least two important functions: (1) it acts as a ´Static Dam´ that prevents the unregulated outflow of tears from the ocular surface and (2) it acts as a ´dynamic wiper´ that removes the ´old´ tear film from the ocular surface and reforms a ´new´ tear film. This is an amazing functional capacity of the lid margin, that no technical water barrier can presently meet. The Lid Margin can act as a "STATIC DAM" and as a "DYNAMIC WIPER"
Concerning its static function as a dam, the lid margin is, in a way, “the outer end of the tear film” that normally prevents the pre-ocular tears from spillage out of the eye and over the outer lid skin - before they can physiologically drain into the nose. The lid margin thereby helps to hold the pre-ocular tear film in place and aids the maintenance of the spread tear film. However, tear spillage (epiphora) can still occur physiologically during crying when the tear volume is strongly increased and extends the capacity of the lids as a “dam”. The function of the Lid Margin as a "Dynamic Wiper" is necessary for the transformation of tear fluid on the eye into a very thin pre-ocular tear FILM which is the pre-requisite for intact refraction at the air-to-tear interface of the superficial Tear Film Lipid Layer (TFLL). This is the main surface of the eye for refraction with about three quarters of the refractive power of the eye and therefore indispensable for perfect visual acuity. A perfect tear film is however only a necessary but not a sufficient parameter for good vision. At the ocular surface also the underlying corneal surface must also be reasonably smooth and with appropriate curvature because other-wards higher order aberrations occur that can often only be corrected by a medical contact lens, preferably a SCLERAL LENS. This is discussed in the contact lens chapter in more detail [LINK]. The Lid Margin acts as a "DYNAMIC WIPER" that distributes the Tear FLUID into a very thin pre-ocular Tear FILM that is a pre-requisite for perfect refraction and for perfect visual acuity. In order to fulfill its functions, the lids and the lid margin does not only need to be structurally intact but it must also be congruent with the eye ball. This is no longer the case in wide-spread lid deformations that mainly occur with advancing age such as e.g. ectropion and entropion or in complicated scarring after trauma. Furthermore the internal accessory structures such as the lid muscles, the orbicularis muscle and the muscle of Riolan must be structurally intact as well as their innervation including the central relais stations in the brain stem. Cranial Nerve VII palsy is is a typical and not rare example here. Any disturbance of the eye lids in structure, congruity and in function can together be addressed as Eye "LID and BLINIKING DYSFUNCTION" abbreviated as "LBD" - which is suggested as a new term in the NEW HOLISTIC CONCEPT ON THE PATHOPHYSIOLOGY OF DRY EYE DISEASE. This condition may lead to a dysfunction of the tears and of the ocular surface and may primarily lead to the onset or aggravation of Dry Eye Disease as discussed there [LINK]. Dysfunction of the lid and lid margin is not only an important factor in the development of ocular surface disease, specifically of dry eye disease but vice versa, a manifest dry eye disease can also induce alterations and subsequent dysfunction of the eye lid margin and lid function. The different zones of the lid margin can individually be altered in disease. The different zones of the lid margin can easily be seen in the slit lamp and in respective photos that show a lid margin in a normal or everted positions. The most obvious differentiation that can even be seen without a slit lamp – it is the division of the lid margin into the free lid margin with a border at each side, anterior and posterior. The free lid margin is the lid surface towards the palpebral fissure. It is looking upwards in the lower lid and downwards in the upper lid. The free lid border is a clinical terminus and therefore dictated by what can be seen with the naked eye or with a slitlamp. The "free" lid margin is thus the region of the lid margin that is “free” of other structures. It is therefore limited by and extending between the orifices of the Meibomian glands ... and the start of the posterior row of eye lashes. The lid margin is divided, along the clinical picture, into the free lid margin with a lid border on each side (inner lid border [ILB] and outer lid border [OLB]). Histologically, the epidermis extends further posterior just behind the orifices of the Meibomian glands. In a histological and also in an embryological view it would make more sense when the posterior end of the cornified epidermis would be considered also as the end of the free lid margin. This is based on the findings that the epidermis gives rise to the hair follicles and to their associated glands of Zeis (z) and Moll (m) in the front and to the Meibomian glands in the back that are epidermal sprouts and therefore open still within the epidermis. Anyway, the free lid margin is continued by two lid borders where the lid margin turns around, either to the anterior/ outer, skin side as the anterior/ outer lid border, or to the posterior/ inner, conjunctival side at the posterior/ inner lid border. It can be noted that the anterior lid border with the ciliary hairs is rather round whereas the posterior lid border is sharp and is in contact with the eye ball which is necessary for the guidance of the tears. The anterior lid border starts where the ciliary hairs shafts come out of the tissue surface and the posterior lid border starts, in a histological sense, where the epidermis ends behind the Meibomian gland orifices. Only histology can analyse the different cellular structure of the epidermis vs. the mucocutaneous junction vs. the conjunctival nature of the lid wiper. The respective studies have greatly improved our understanding of the posterior lid border, with the MCJ and the Lid Wiper in health and disease of the ocular surface. Therefore, we will in the following go along the histological definition of epithelial zones if not otherwise stated.